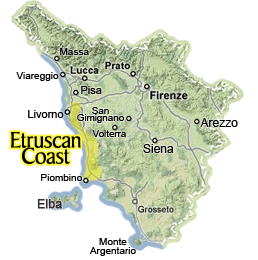 The Etruscan Coast is a long narrow stretch of coastline along Tuscany's coast that goes from Livorno to Piombino and includes parts of four internal city areas: Collesalvetti, Sassetta, Suvereto and Campiglia Marittima. The name of this beautiful coastal area is tied to the presence of the Etruscan civilization that inhabited this area from the start of the 9th century BC (way before the Romans), as so many archeological sites deminstrate today. At the Archeological Park of Baratti and Populonia, in the Gulf of Baratti between San Vincenzo and Piombino, you can nowadays visit one of the most important sites, including a large necropolis, in this area left by the ancient Etruscans. Don't miss to visit Populonia Alta, a wonderful tiny hamlet, built up on a hill faced of the Gulf of Baratti, which is the first and unique coastal village built by Etruscans. The Etruscan Coast also includes the archeological and natural areas of the Parks of the Val di Cornia, to which the Archeological Park of Baratti and Populonia as well as the Coastal Parks of Rimigliano amd of the Sterpaia are part of. In June the main cities of the Etruscan Coast celebrate the arrival of Summer in a special Blue Night which provides with parties, concerts, shows and several cultural and food and wine events. Are you planning a holiday on the Etruscan Coast, along the Val di Cornia? If you like sandy beaches, you will have lots of choices! Follow our suggestions to find which beaches you should go to! A long avenue of cypresses leads to Bolgheri, a small pearl of the Etruscan Coast. You can't miss a visit to this precious hamlet, with its castle made of red bricks, the shops full of food and wine specialties and lots of good restaurants where you can enjoy a relaxing meal and great wine! Poggio all'Agnello has been our summer time destination for beach vacations the last 4 years! Read our review to see why we love it and recommend it to everyone (hint: several pools, beach nearby, space and comfortable apartments ;) ). Take a walk through the historical center of Piombino and discover a city often known only for its marina, as it is an important stop for ferries headed to the Tuscan Archipelago. Piombino offers much more with an amazing view of Elba Island, a 13th century castle and an unbreakable bond with the sea. Campiglia Marittima, with its lively historical center and beautiful medieval fortress, is one of the most enchanting towns to be found along the Etruscan Coast. It is a small hamlet perfect for exploring on foot and worth discovering on a day or even for your stay in the area. This farmhouse just outside Suvereto offers peace and tranquility in the Tuscan countryside while being about 20 minutes from the beach! It grows organic produce and offers guests vegetarian meals (vegan upon request) made with its own fresh home grown produce, offering guests the chance to enjoy delicious meals without venturing far from "home". Located in the small hamlet of La Sassa, this restaurant is named after the small natural grotto in which it is located and where a few tables are in. A welcoming setting, the kitchen offers authentic traditional Tuscan dishes.